Rating: 1 That's right: just another scam! The Bad: This system is a duplicator all right, it doesn't duplicate money but instead has been duplicated from every other Binary Options scam out there. It lies to you, gives you false hope and offers zero actual evidence of success. I’m in the mood to call someone out. Yeah that’s right, I hate people that lie and cheat and swindle. I want to call out a person and spotlight their lies, but I can’t. I can only tell you about the product they have made that they are using to cheat real people out of real money: the Million Dollar Duplicator. This “system” is designed to help you to make your fortune by trading Binary Options. 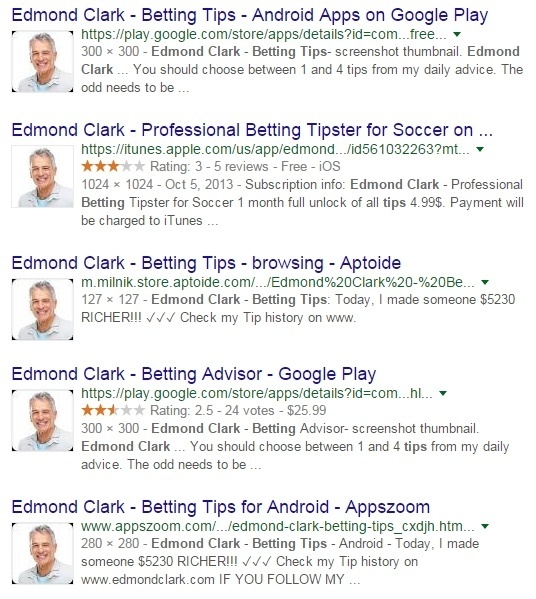 Of course, if you were unlucky enough to give this a go, you’ll quickly find it doesn’t work. If you have been fortunate enough to escape the grasp of the Million Dollar Duplicate, let me explain why you shouldn’t trust it. Binary Options is the name of the game. This trading method is designed to be easy to use, but due to its nature it is a high risk trading method with little reward. The FTC enforce that any system that promotes or endorses Binary Options should put a government required disclaimer about the risks involved: that’s how much you should worry about it. Million Dollar Duplicate is one of a long list of so called systems that allege they will make you money via Binary Options. In fact, this particular system states it will help you win 100% of the time. What a crock! Binary Options works in the way that you pick a stock type, or commodity and a time period (very short time periods, think minutes rather than months), and then choose whether the price at the end of the time period will be higher or lower than the starting price. If you guess correctly, you get your investment back with a little on top (after broker fees). The lack of a time period means that trend information is useless. The volatility of the stock prices (they will change every second) means that predictions go out of the window. Combine this with fees and poor return rate and you have a hell of a messy way to make money. You’re essentially betting on a coin flip. You can tell a lot about a system or company by looking at their sales material. If they lie to you from the get go, then they will lie, wheedle and cheat you throughout the process. Million Dollar Duplicator lies and manipulates from the start. It begins by saying that only 97 people will have the chance of getting access to the software. This is utter rubbish, if it were true then why would the army of affiliates promoting this system even bother? The people behind it will want thousands of people through the door to make their efforts worthwhile (they get a commission from the Binary Options broker for every person that deposits money). The videos main focus is on promoting a life of luxury. In fact, it states that you will be able to live a life of luxury only 48 hours after watching the video. It pushes images of fast cars, large mansions and the “good life”. Of course, this is all designed to make you want, no desire, a better life. And the system positions itself as the only thing between you and that life. I mean, who wouldn’t desire a $30,000 per month income without any costs attached to it? And that’s exactly what Million Dollar Duplicator pushes your way, overlooking things like truth, honesty and ethics. The script for the video tries to allay your fears, because a lot of people who watch videos like this have been burnt time and time again by gurus and fake products offering them a life changing experience only to deliver an empty wallet. It says that it doesn’t offer magical software to make you “trillions of dollars in a matter of seconds”, yet seconds ago it said that you could be living the luxury life in 48 hours. Which is it? Perhaps then that Michael has had more success with his stock photo business than Binary Options? Further “proof” arrives in the form of two video testimonials, which are aimed to stop you from thinking that all of this is BS, when really that is exactly what you should be thinking! After that comes the “life changer” section. This is what I term for a part of the video that tries to empathise with you and explains how this so called system can free you from your life of drudgery/debt/boredom/insert what you will here. The next so called proof, is a video narrated by a Brit. It doesn’t show the person but apparently this is them using the system. This is not proof. It shows two separate time periods cut together in the video. The way it’s shown is a common method as it allows the content to be easily faked, while to the inexperienced eye it looks real. Apparently in under an hour, this guy made $10,000. To quote from the video, I call BS! Here’s my Million Dollar Duplicator account that I just opened. See how I have $5,987,543.58? Not bad considering I have just opened it, not deposited a dime and never plan to. See how easy it is to fake this type of screen? Even though near the start of the video, the narrators stated that they are not like any other system out there, the Million Dollar Duplicate sure uses a lot of the same tactics. Take the story of how the system was created: by the narrator, traders, programmers and statisticians all from Wall Street brokerages. Allegedly they used the inside trading information to build this magical software. This software is so good it can predict trades before the trades exist. Spooky eh? On and on the video goes using the same tried conceits and providing no proof whatsoever. Instead it shoves lie after obvious lie down your throat. The member’s area you are redirected to after handing over your email, is in fact just a staging area. It is here so you can sign up to the Binary Options broker (no, your email address didn’t do that, it was just added to their mailing list in order to spam you or to sell to a spammer, because now you have been marked as a possible easy target). More lies are shown here. For example, take the varied stamps and awards that are shown on the site. These are generic stock imagery and do not link to any site to verify anything: they are just for show. The live trading account is also complete BS. The data comes from a site called Binary Bonus, which is used by dozens of other Binary Options scams, if not more. The data cannot be verified as real, let alone as being a result of this particular system. What about the Users Profits section? Well nothing can be verified here apart from the use of stock imagery. 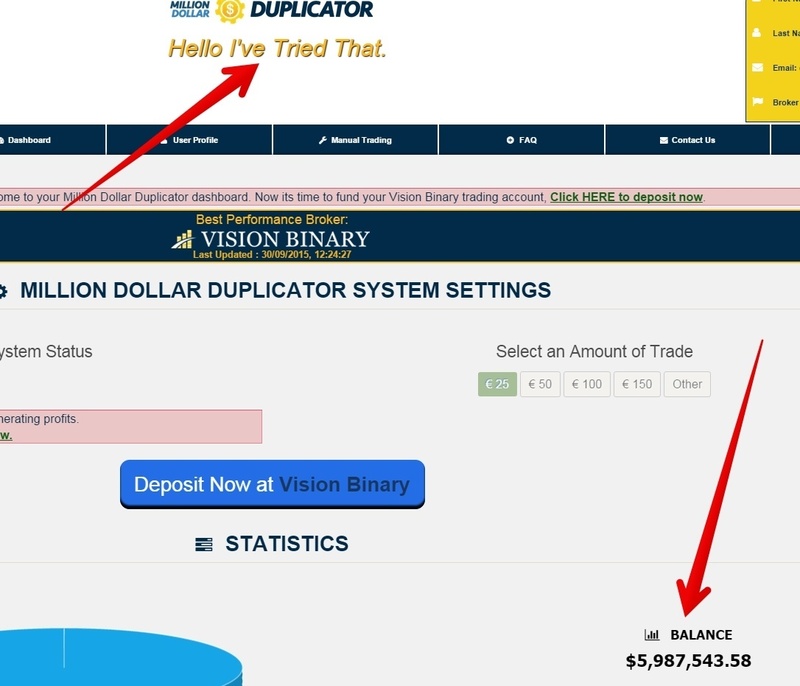 Million Dollar Duplicator is yet another Binary Options scam. Sure, it tells a good story, but once you scratch away the façade, you quickly realize that nothing you are being told if true. Would you entrust a liar with your hard earned money? I wouldn’t! That’s why my advice to you is to walk away from Million Dollar Duplicator and any other Binary Options system promising you easy, autopilot money. Your analyst is sooo right but let me explain further more. All of those softwares are all made the same way and in fact they are all put up by the same people who desing casisos softwares. that you never heard about witch is the same as sending money to an African guy who say you got 1m $ waithing for you. Those poeple should be in jail and trow away the key. I’v been reporting those scam to IC3 (fbi) but since there server are located in some shady countries it is very hard to get to them crooks. BTW don’t beleive a word about those testimony they are all fakes and the proof is you’ll se the same persons in other scams. Feel free to copy my comment and spread the word .